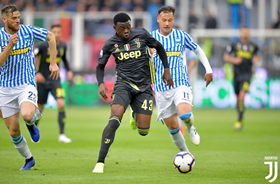 Paolo Gozzi Iweru has become the first player of Nigerian descent born this century to feature in the Italian Serie A, allnigeriasoccer.com reports. Born April 25, 2001, Iweru made his full debut for the Italian champions as they suffered a 2-1 loss to SPAL on Saturday, aged 17 years, 11 months and 19 days. Iweru is the youngest footballer to play in the Italian top flight in the 2018-19 campaign, beating the previous record held by Emanuel Vignato, who was aged 18 years, 4 months and 28 days when he stepped out onto the Allianz Stadium turf in the 61st minute of Chievo Verona's 3-0 loss to Juventus on January 21, 2019. The absolute record for the youngest player of Nigerian descent to debut in the Serie A is held by Stefano Okaka, who made his maiden appearance for Roma aged 16 years, 4 months and 9 days in December 2005. At 16 years, 10 months and 10 days, former AC Milan striker Mohammed Aliyu Datti remains the youngest Nigerian-born player to feature in the Serie A. A pacy and physical defender who knows how to read the game, Iweru was born in Torino and has represented Italy at U16, U17 and U19 levels.